NOTICES FILINGS TODAY FOR APRIL CONTRACT MONTH: 25 NOTICE(S) FOR 2500 OZ. The open interest in silver continues to advance with today’s reading just under 222,000 contracts or about 2,000 contracts below the record set last year. The price of silver is a good $2.44 below the price when the record OI was set. There is no question that the hedge funds together with a possible sovereign entity are willing to take on the crooked bankers. The volume on the silver comex was extremely high today at 126,689 contracts and it is conceivable that on Monday, we may have a record open interest at over 225,000 contracts. In silver, the total open interest FELL BY A TINY 240 contracts DOWN to 221,862 WITH THE RISE IN SMALL PRICE RISE ( 6 CENTS) WITH RESPECT TO YESTERDAY’S TRADING. THE HEDGE FUNDS (MANAGED MONEY) CONTINUES TO SLOWLY ADD TO THEIR POSITIONS WITH THE BANKERS TRYING TO COVER THEIR EVER BURGEONING SHORTS (OVER 555 MILLION OZ) BUT TO NO AVAIL. In ounces, the OI is still represented by just OVER 1 BILLION oz i.e. 1.109 BILLION TO BE EXACT or 158% of annual global silver production (ex Russia & ex China). In gold, the total comex gold also ROSE BY 3,108 contracts WITH THE RISE IN THE PRICE OF GOLD ($4.90 with YESTERDAY’S TRADING). The total gold OI stands at 428,795 contracts. we had 25 notice(s) filed upon for 2500 oz of gold. 1. Today, we had the open interest in silver FELL BY 240 contracts DOWN TO 221,862 DESPITE THE FACT THAT SILVER WAS UP 6 CENT(S) with YESTERDAY’S trading. We no doubt had some considerable short covering but the longs keep piling on making it difficult for them to cover. In contrast, the gold open interest ROSE CONSIDERABLY BY 3,108 contracts UP to 428,795 WITH THE RISE IN THE PRICE OF GOLD TO THE TUNE OF $4.90 (YESTERDAY’S TRADING). i)Late THURSDAY night/FRIDAY morning: Shanghai closed UP 5.61 POINTS OR 0.17%/ /Hang Sang CLOSED DOWN 6.42 POINTS OR .03% . The Nikkei closed UP 67.57 OR 0.36% /Australia’s all ordinaires CLOSED UP 0.09%/Chinese yuan (ONSHORE) closed UP at 6.8975/Oil UP to 52.22 dollars per barrel for WTI and 55.19 for Brent. Stocks in Europe MOSTLY IN THE RED ..Offshore yuan trades 6.8930 yuan to the dollar vs 6.8976 for onshore yuan.THE SPREAD BETWEEN ONSHORE AND OFFSHORE NARROWS AGAIN/ ONSHORE YUAN STRONGER AND THE OFFSHORE YUAN MUCH WEAKER AND THIS IS COUPLED WITH THE STRONGER DOLLAR. v)A sensational speech given to the Mines and Money Conference, Hong Kong today. vi)As we reported to you last week, iron ore prices plunge again as China has a massive glut: and they talk about the reflation trade!! Instead of a gain of 180,000 jobs, the BLS reports only a 98,000 job gain with another surprising drop in the unemployment rate to 4.5%. What is also bad, is that the two prior months were revised lower by 22,000 jobs and 16,000 jobs. xiv)The new forecast for first quarter GDP: only .6% and these bozos want to raise rates? The total gold comex open interest ROSE BY 3,108 CONTRACTS UP to an OI level of 428,175 WITH THE RISE IN THE PRICE OF GOLD ( $4.90 with YESTERDAY’S trading). We are now in the contract month of APRIL and it is one of the BETTER delivery months of the year. In this APRIL delivery month we had AN ANOTHER LOSS OF 183 contract(s) FALLING TO 1,958. We had 126 notices served yesterday so we lost another 57 contracts or 5700 oz will not stand for delivery in the active delivery month of April and these were cash settled via the EFP route highlighted by James Turk and myself on April 4/2017. The non active May contract month GAINED 30 contract(s) and thus its OI is 2580 contracts. The next big active month is June and here the OI ROSE by 1977 contracts UP to 308,324. And now for the wild silver comex results. Total silver OI FELL BY A TINY 240 contracts FROM 222,102 DOWN TO 221,862 DESPITE YESTERDAY’S 6 CENT GAIN. THE BANKERS SUPPLIED THE NECESSARY CONTRACTS TO OUR HEDGE FUND LONGS WHO CONTINUE TO PILE INTO SILVER ON THE LONG SIDE. HOWEVER THE BANKERS HAVE BECOME FRIGHTENED WITH RESPECT TO THE HIGH OPEN INTEREST SO THEY DECIDED TO SHORT COVER SOME OF THEIR HUGE SHORTFALL. We are moving CLOSER TO the all time record high for silver open interest set on Wednesday August 3/2016: (224,540). The closing price of silver that day: $20.44. WE ARE ONLY 2,000 CONTRACTS AWAY FROM RECORD HIGHS IN OI AND YET WE ARE $2.06 BELOW THE PRICE OF $20.44 WHEN THAT RECORD WAS SET. We are in the NON active delivery month is APRIL Here the open interest GAINED 19 contracts. We had 0 notices filed yesterday so we GAINED 19 contracts or an additional 95,000 oz will stand for delivery. The next active contract month is May and here the open interest SURPRISINGLY LOST ONLY 677 contracts DOWN to 154,285 contracts which is astonishingly high. The non active June contract GAINED 4 contracts to stand at 168. The next big active month will be July and here the OI gained 32 contracts up to 39,420. FOR COMPARISON SAKE, ON APRIL 5/2016 WE HAD 108,102 CONTRACTS STANDING FOR DELIVERY. SO YOU CAN VISUALIZE FOR YOURSELF THE HUGE DIFFERENCE BETWEEN 2016 AND THIS YEAR. Today the estimated volume was 354,517 contracts which is excellent. Yesterday’s confirmed volume was 170,128 contracts which is fair. Today, 0 notice(s) were issued from JPMorgan dealer account and 0 notices were issued from their client or customer account. The total of all issuance by all participants equates to 25 contract(s) of which 0 notices were stopped (received) by jPMorgan dealer and 10 notice(s) was (were) stopped/ Received) by jPMorgan customer account. To calculate the initial total number of gold ounces standing for the APRIL. contract month, we take the total number of notices filed so far for the month (587) x 100 oz or 58,700 oz, to which we add the difference between the open interest for the front month of APRIL (1958 contracts) minus the number of notices served upon today (25) x 100 oz per contract equals 239,400 oz, the number of ounces standing in this active month of APRIL. we lost 57 contracts or an additional 5700 oz will not stand and these guys were cash settled via the EFP route. IN THE LAST 9 MONTHS 74 NET TONNES HAS LEFT THE COMEX. Thus the initial standings for silver for the APRIL contract month: 641(notices served so far)x 5000 oz + OI for front month of APRIL. (265 ) -number of notices served upon today (118)x 5000 oz equals 3,940,000 oz of silver standing for the APRIL contract month. Yesterday’s confirmed volume was 59,908 contracts which is EXCELLENT!!. At 3:30 pm we receive the COT which gives us position levels of our major players. those large specs that have been long in gold added a huge 11,222 contracts to their long side. those large specs that have been short in gold covered a large 6394 contracts. those commercials that have been short in gold added a large 10,257 contracts. those small specs that have been short in gold added a tiny 289 contracts to their short side. on the short side they decreased their position by a tiny 93 contracts. the large specs go net long by 17614 contracts. the commercials went net short by 18,902 contracts. the hedge funds as a subset went net long by only 1024 contracts. this is very bearish as the commercials have to raid but the hedge funds are staying out of the game. those large specs that have been short in silver added 3633 contracts to their short side. those commercials that have been short in silver added a huge 10,091 contracts to their short side. those small specs that have been short in silver added 913 contracts to their short side. those hedge funds that have been on the short side increased 2921 contracts to their short side. Managed money went net long again by 11,904 contracts. yet the hedge funds went net long again by 11,904 contracts. The hedge funds are taking on the crooked banks. They add hugely on whacking days and back off a bit on up days. This is going to be quite a battle! 1. Central Fund of Canada: traded at Negative 8.2 percent to NAV usa funds and Negative 7.9% to NAV for Cdn funds!!!! Note: Sprott silver trust back into NEGATIVE territory at -43% /Sprott physical gold trust is back into NEGATIVE/ territory at -0.19%/Central fund of Canada’s is still in jail but being rescued by Sprott. *LAST 69 TRADING DAYS: A NET 15,82 TONNES HAVE NOW BEEN ADDED INTO GLD INVENTORY. *FROM FEB 1/2017: A NET 41.25 TONNES HAVE BEEN ADDED. April 7./ a withdrawal of 947,000 oz of silver from the SLV/Inventory rests at 328201 million oz. Gold and silver prices spiked sharply higher today, as investors piled into the safe haven asset in the wake of U.S. bombing of Syria. Gold and silver bullion rose more than 1% and oil prices rose 1.4% after the bombings. Gold reached a 5-month high as risk aversion returned to markets leading to a sell off in stocks and oil prices rising. Brent crude futures surged more than 2% after the US attack and were last up 1.5% at $55.72 a barrel. Gold earlier climbed as much as 1.4 percent to its highest since Nov. 10 at $1,269.30. Gold is now trading at levels not seen since the November election of Donald Trump as U.S. president. Gold is on track for a fourth straight week of gains and this in conjunction with the higher 2016 close and the higher Q1, 2017 close is bullish from a technical and a momentum perspective. Gold has not managed to close above the 200 day moving average – $1,257/oz – in recent days and a weekly close above that level today will be very bullish for gold. This is especially the case given the very uncertain geo- political backdrop. The unilateral action by President Trump and the use of cruise missiles against a Syrian air base, has escalated tensions with Syrian allies Russia and Iran. Markets were already nervous as Trump met Chinese leader Xi Jinping for talks over flashpoints such as North Korea and the U.S. massive trade deficits with China and massive and continuously increasing national debt. Other geo-political concerns such as Brexit and the upcoming French elections is leading to ongoing robust demand for gold and silver bullion. China’s Shandong Gold Mining Co. Ltd. will pay $960 million for a 50 percent stake in Barrick Gold Corp.’s Veladero gold mine in Argentina, the Canadian miner said in a press release today. The deal, which confirms an earlier Reuters report about the talks, will also see the two firms look at jointly developing the nearby undeveloped Pascua-Lama gold and silver project that straddles the border of Argentina and Chile. As we reported to you last week, iron ore prices plunge again as China has a massive glut: and they talk about the reflation trade!! Just a week ago we warned of China’s record glut of Iron Ore (enough to build 13,000 Eiffel Towers), and following warnings from Barclays and RBA of a likely pullback, futures in Dalian sank to lowest since November as steel sags. Bloomberg reports that iron ore is getting beaten back down in a told-you-so rout after a procession of analysts, Australia’s central bank and miners themselves delivered warnings that gains were unsustainable, with the latest blow landed by the world’s top shipper saying prices are set to revisit the $50s. Ore with 62 percent content in Qingdao fell 6.8 percent to $75.45 a dry ton, entering a bear market after declining more than 20 percent from a Feb. 21 peak, according to Metal Bulletin Ltd. The price has now erased all of this year’s gains, declining 3.1 percent. Earlier in Asia, futures in Dalian plunged 6.2 percent to the lowest close in five months as steel sank. Iron ore is in retreat after hitting the highest level since 2014 in February amid concern that rising supplies from mines in Brazil, Australia and possibly China will again exceed demand, with warnings from Barclays and BHP Billiton flagging losses. There’s also concern that additional curbs in China may hurt consumption. This is certainly not helping the concept of a global reflation trade as yet again, massive credit-fueled capital mis-allocation simply papers over short-term cracks leaving a bigger more damaging hangover in its wake… unless just a little more credit fueled zombification will help. Households face the end of free banking if the low-growth, low-interest rate environment persists, according to the International Monetary Fund. The IMF said weak growth combined with ageing populations meant financial institutions around the world would be forced to overhaul their business models to adapt to a new normal. Demographic change was likely to reduce demand for credit from households and businesses but increase the need for easy-access accounts, payments services and products such as health insurance. Exploration geologist Keith Barron is best known for discovering the colossal Fruta del Norte gold deposit in Ecuador, but if his new venture is successful he may soon have another claim to fame. Barron is now at the helm of Aurania Resources, and it won’t be long before the company begins work at the Lost Cities project, also in Ecuador. His goal is a lofty one: to find Logroño de los Caballeros and Sevilla del Oro, two settlements that produced gold during the 16th century but have since been lost. A sensational speech given to the Mines and Money Conference, Hong Kong today. Chris Powell: Why invest in gold miners if they won’t defend themselves? Since we gathered here a year ago, gold and silver market manipulation has burst into the open and become undeniable. Even some mainstream financial news organizations have had to report it, if begrudgingly and only briefly. But the gold and silver mining industry itself keeps running away from it. Fortunately, this conference allows it to be discussed anyway. Much more evidence of government involvement in gold and silver price suppression has come out during the last year. According to its own recent reports, the Bank for International Settlements, the central bank of the central banks and their gold broker, re-entered the gold swap business in a big way after having withdrawn from it for a time. Gold swaps allow central banks and their agent investment banks to move gold and gold derivatives around the world so that metal can be applied for price suppression where gold demand most threatens to get out of control. An increase in gold swapping by the BIS indicates greater strain in the gold market and more danger to government currencies from gold’s use as a competitive reserve currency. Also in the last year, the Austrian and Netherlands central banks refused requests from gold researcher Koos Jansen, who writes for Bullion Star in Singapore, to disclose lists of the gold bars in their national reserves. Such disclosure might allow researchers like Jansen to ascertain how much of the gold in national reserves has been surreptitiously leased or swapped and put into the market for price suppression. That is, Greenspan told Congress not to worry about the gold price because central banks had it under control with surreptitious leasing of their gold reserves. The Indian people’s attachment to gold as money and wealth seems as firm as their government’s desire to impoverish them by suppressing gold’s price as measured by government currencies. India is a developing country but imagine how wealthy it would be if central banks and governments, including India’s own government, stopped trying to suppress the measure of the money that Indians most want to use. From the documentation GATA has compiled it is plain that governments and central banks are constantly operating in the gold market surreptitiously to defend their currencies and to control interest rates. This destroys free markets everywhere, since currencies and interest rates are measures of value. Lately central bankers have even been caught on video confirming these surreptitious interventions against gold. Mooslechner said Asian central banks are “intervening” in the gold market, though of course no such interventions have ever been announced. Unfortunately Cambone did not press Mooslechner about this, and when other journalists contacted the Austrian central bank in the hope of following up with Mooslechner about his comment to Kitco, the bank refused to make him available. Here is William Dudley, president of the Federal Reserve Bank of New York, taking questions after his presentation at the Virginia Military Institute in March last year. First Dudley is asked by a GATA supporter in the audience, Ware Smith, about the German Bundesbank’s repatriation of gold reserves from the New York Fed’s vault and other central bank vaults. Dudley answers the German repatriation question in detail. Then Dudley is asked by Smith whether the Federal Reserve is involved with gold swaps. Dudley replies that he doesn’t want to talk about “individual customer kind-of transactions” — even though he had just talked at length about the Fed’s “individual customer transactions” with the Bundesbank. But Smith’s second question did not ask Dudley about “individual customer transactions.” Smith asked Dudley only the general question, the question GATA itself put to the Fed in 2009: Is the Fed involved with gold swaps? A few days after Dudley refused to answer the gold swaps question in Virginia, I e-mailed the question to the publicist for the New York Fed: Is the Fed involved with gold swaps? The New York Fed’s publicist directed me to video of Dudley’s speech in Virginia that was posted on the internet but refused even to acknowledge my question. GATA has brought all this to the attention of The Wall Street Journal and many other mainstream financial news organizations and has urged them to put the gold swap question and other specific gold questions to the Fed and other central banks. The mainstream news organizations have refused to press these questions. These questions are just too sensitive. Honest answers to them or even publicity about the refusal of the Fed and other central banks to answer the questions would explode their surreptitious market rigging. Indeed, surreptitious market rigging has become the primary purpose of central banking throughout the world. Can anyone wonder why this information is concealed? As the secret IMF staff report of March 1999 says, it is concealed to facilitate secret market interventions by governments and central banks. Perhaps most remarkably, in January this year a major gold mining company executive acknowledged on video that he believes that governments are rigging the gold market. Here is Canadian billionaire Frank Giustra, a confidant of former President Bill Clinton, being interviewed by money manager Marin Katusa at the Vancouver Resource Investment Conference in January. Katusa asks Giustra why the gold price doesn’t match the political and financial turmoil in the world. First, if governments are suppressing the gold price, why should anyone invest in gold mining companies? And second, if governments are suppressing the gold price and you’re an executive of and big investor in gold mining companies, are you going to try to do anything about it, or are you just going to sit there and quietly accept it? Suppression of the gold price supports government-issued currencies, helps suppress all commodity prices, and thereby destroys markets everywhere and expropriates the developing world. Gold price suppression thereby constitutes the primary mechanism of imperialism — a mechanism more effective than armies, since it is surreptitious and not generally understood. So I would put two questions to all of you here, since you’re all involved in the commodity business one way or another. Can you at least acknowledge, as Giustra finally has done, that the governments of developed countries are waging war not only against your businesses but also against the developing world? And if you can acknowledge this, will you try to do anything about it? If you would like to try doing something about it, GATA can make some suggestions and provide more information. I will be glad to hear from you by e-mail at CPowell@GATA.org. 3b Japan 10 year bond yield: FALLS TO +.061%/ !!!! (Japan buying 100% of bond issuance)/Japanese yen vs usa cross now at 110.68/ THIS IS TROUBLESOME AS BANK OF JAPAN IS RUNNING OUT OF BONDS TO BUY./JAPAN 10 YR YIELD FINALLY IN THE POSITIVE/BANK OF JAPAN LOSING CONTROL OF THEIR YIELD CURVE AS THEY PURCHASE ALL BONDS TO GET TO ZERO RATE!! 30 SNB (Swiss National Bank) still intervening again in the markets driving down the SF. It is not working: USA/SF this morning 1.0060 as the Swiss Franc is still rising against most currencies. Euro vs SF is 1.0693 well above the floor set by the Swiss Finance Minister. Thomas Jordan, chief of the Swiss National Bank continues to purchase euros trying to lower value of the Swiss Franc. After initially tumbling in the aftermath of the U.S. missile attack on Syria which jolted financial markets, boosting haven assets and temporarily shifting investor focus from today’s jobs data , S&P futures have managed to recoup all losses (the Nikkei closed up 0.4% after sliding earlier in the session), with Europe also just fractionally lower and climbing fast. A U.S. defense official told Reuters the missile strike was a “one-off”, helping to calm market nerves. “The U.S. missile strike on a Syrian air base overnight caused a knee-jerk shift into safe havens, although the impact was moderate as it is being interpreted as a one-off proportionate response,” said Ian Williams, a strategist at Peel Hunt in London. Gold, crude and government bonds were among the biggest winners following the first military strike undertaken by Trump’s administration, as some traders sought safety and others judged increasing tension in the Middle East would spur crude. Russia’s ruble dropped the most in almost a month and its bonds fell as optimism over a detente with the U.S. evaporated. 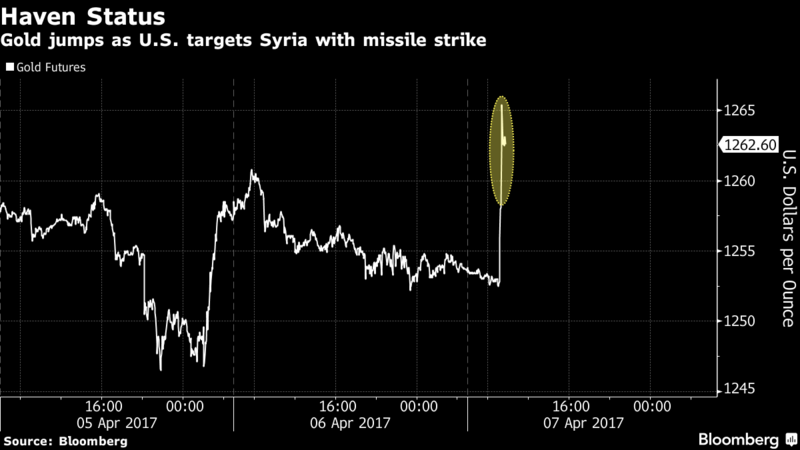 The lira and stocks retreated in Turkey, which shares a border with Syria. The U.S. dollar recouped all of its losses against a basket of major currencies and was last trading little changed. S&P 500 futures were down 0.1%. European stocks fell 0.3% weighed down by weakness in mining stocks as investors locked in some profits following the sector’s stellar run this year. While volatility also spiked across global stock markets in the wake of the attacks, the initial impact began to fade for some assets as investors resume digesting a week of developments, from a meeting between Trump and President Xi of China, to Fed signals it may reduce its balance sheet this year and the ECB underscoring its dovishness as Bloomberg notes. Attention now turns to payroll data, after a strong private reading and weak automaker sales gave conflicting signals on the U.S. economy. As of 6:40am ET, S&P 500 futures slipped less than 0.1% percent, while the Stoxx Europe 600 Index dropped 0.3 percent. Volatility measures from Hong Kong to Europe increased. Asian stocks shook off declines to follow Japanese equities higher, with yen rallying along with Treasuries after Syria strikes. Gilt futures gained after soft U.K. manufacturing data, some buying from domestic accounts being seen, with Russia’s ruble falling most among major global currencies and the nation’s borrowing costs surging as U.S. airstrikes dash hopes for an improvement in ties under Donald Trump. “Safe-haven flows are always affected by political events, and when it affects countries where the U.S. and Russia are interested, then investors become even more nervous because of relations (between those two),” said DZ Bank strategist Daniel Lenz. While it will be of secondary importance today, overnight China reported that its FX reserves rose fractionally for a second consecutive month. Looking at the day ahead, non-farm payrolls may rise by 180k, according to economists (a full preview can be found here) slightly less than the six-month and 12-month averages. Fed’s Dudley speaks on financial regulation. Elsewhere, euro zone finance ministers are due to meet with a discussion on Greece’s progress in implementing reforms needed to unlock aid part of the agenda. Asia markets shrugged off the early gains from the gains on Wall St. as sentiment in the region soured after the US conducted strikes in Syria. This saw ASX 200 (+0.1%) and Nikkei 225 (+0.4%) trimmed opening gains, although the latter staged a recovery with outperformance in Toshiba shares on reports Hon Hai is to submit a near JPY 3tln bid for the Co.’s chip unit. Hang Seng (-0.1%) and Shanghai Comp. (+0.2%) were mixed despite the PBoC continuing to hold off on open market operations which resulted to a weekly net drain of CNY 100bIn. 10yr JGBs and T-notes were underpinned by safe-haven demand resulting from the Syria strike, which saw the US 10yr yield drop to a 4-month low and under 2.3%. PBoC refrained from conducting open market operations for a weekly net drain of CNY 100bIn vs. Prey. net drain of CNY 290bn. European equities followed the soft lead from Asia, with all sectors trading in the red with the exception of energy names. Syria has dictated play here in a similar fashion to other asset classes amid light equity specific news, and with participants now awaiting the US jobs data or any comments from president Trump this afternoon on any future action in Syria, as well as continued attention on the progress of his talks with China President Xi. The miss of Exp. in UK data was relatively shrugged off by Gilts, which continued to trade in line with the rest of European paper. Bunds opened higher as European participants reacted to the aforementioned overnight developments, however the German benchmark has spent much of the session paring its opening gains, albeit remaining modestly higher by mid morning. Periphery yields continued to trade in a tight range, with participants keeping an eye on any Greece related developments from the Eurogroup meeting, although with volatility more likely to hold off until this afternoon’s NFP report from the US. In currencies, the ruble dropped 0.9 percent as of 11:16 a.m. in London. The currency has been trading near the highest since July 2015. President Vladimir Putin believes the U.S. airstrikes caused “considerable damage” to relations with Russia, a Kremlin spokesman said. The Bloomberg Dollar Spot Index was little changed. The yen rose 0.2 percent, paring gains of as much as 0.6 percent. The euro slipped 0.1 percent, the British pound dropped 0.4 percent, and the Turkish lira pared losses to trade 0.5 percent lower. Focus today has fallen on the overnight airstrikes by the US on Syria, with safe havens the notable benefactors. The likes of JPY and CHF have both been the notable movers in FX markets in a flight to safety. Elsewhere in FX, the only notable data of the morning has come in the form of the UK industrial and manufacturing production, with the downbeat reading weighing on GBP as GBP/USD slipped back below 1.2450. In commodities, West Texas Intermediate crude climbed 1.4 percent to $52.41, the highest in a month. Oil is up 3.6 percent for the week. Gold jumped 1.1 percent to $1,264.92, the highest since November, following two days of declines. As well as the safe haven currencies, the strikes in Syria also saw upside in gold, with the yellow metal reaching 5 month highs amid concerns of further aggression in the future. The strikes in Syria also pushed the energy complex higher, with WTI futures trading around USD 52.50/bbl amid concerns that global tensions could cause obstacles in the supply chain. Looking at the day ahead, in the US the aforementioned March employment report will be the main point of focus while wholesale inventories and consumer credit data are the other releases due in the US. Away from the data the Fed’s Dudley is due to give a talk on the state of financial regulation in the US. Away from that BoE Carney speaks this morning at 10am BST while the Euro area finance ministers meeting also kicks off in Malta today. Clearly any headlines which emerge from Trump’s meeting with Xi Jingping are also worth watching. 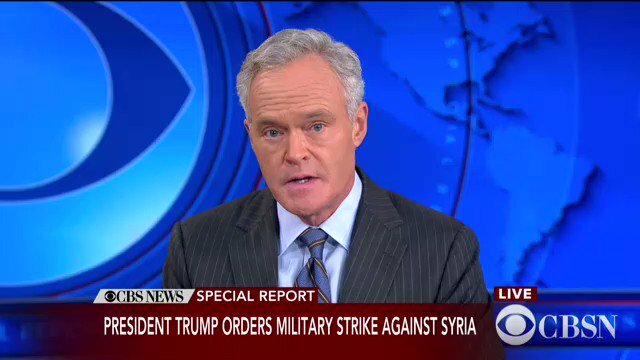 We’re straight to breaking news this morning where overnight, President Trump has taken the first military action of his young Presidency, launching a cruise missile attack at Syria following the gas attack within the country earlier this week. The headlines emerged at about 2.15am BST and reports suggest that 59 missiles were fired, targeting an air base, with President Trump confirming the order a short time ago. Trump released a statement saying that it is in “the vital national security interest of the United States to prevent and deter the spread and use of deadly chemical weapons. There can be no dispute that Syria used banned chemical weapons and violated its obligations under the chemical weapons conventions”. According to Bloomberg the White House was said to have notified Russian forces in Syria prior to the attack. The attack also comes after US secretary of state Rex Tillerson warned last night that a “serious response” was needed and that “steps are underway” for the removal of Syria’s Assad regime. Since the attack we’ve seen House Speaker Ryan and Senator McCain both come out with messages of support. Markets initially reversed early gains and moved into risk-off mode after the strikes but we are seeing a recovery as we go to print. At the time of writing, the Nikkei is back to +0.52% having been up as much as +1.00% initially then down as much as -0.44% following the news. The Shanghai Comp (+0.25%) is now at its highs after initially fluctuating between gains and losses while the Kospi is back to -0.07% after being down as much as -0.47%. The Hang Seng (-0.56%) has also partially recovered earlier heavier losses. The rebound is partly being helped by a further rally for Oil (WTI +1.62% to $52.23/bbl) following the news of the attack. Gold (+0.87%), the Yen (+0.20%) and 10y Treasuries (-3.0bps to 2.310%) are firmer but have also pared some initial stronger gains. Needless to say it’ll be important to see how Europe opens on the back of the overnight news. In addition to digesting these developments, today is payrolls Friday in the US. As we said earlier in the week, it does seem the emphasis for the timing and pace of global hikes has shifted away from employment to inflation in recent months so it’s perhaps not as much of a focal point as some recent prints but the 263k on ADP on Wednesday creates some intrigue. The market is at 180k and DB at 150k with our economists below market on the basis of weather effects as a result of the Winter Storm Stella. As always keep an eye on the other components of the report including the unemployment rate (consensus for no change at 4.7%), average hourly earnings (+0.2% mom expected) and average weekly hours (expected to hold steady at 34.4hrs). Moving on I’ve had a few emails saying that the story I told about my school partnership with golfer Paul Casey in yesterday’s EMR was one I’d told before so apologies for that. I’m either running out of anecdotes, losing my memory or spending too much time watching ‘In The Night Garden’. Or all three. Talking of repetition, yesterday I published a Credit Bites on a similar theme to that I’ve published on a couple of times already this year. Recycling anecdotes and research at the moment. The piece was called “Euro Credit – more expensive than it looks” and highlights that although EU IG spreads to Bunds have been broadly flat since mid-August, Euro Stoxx 50 and peripheral equities are up around 15% and 20% respectively over the same period. US IG credit is also around 25bps tighter since mid August. So it looks as if there’s some catch up potential. However the reality is that the benchmark (bunds) has been the star performer in the DM government bond world over this period. Against a ‘weighted’ government benchmark that we created that matches the geographical split of the corporate index, current spreads are actually fairly close to their post crisis tights and with it close to the tightest they’ve been in a decade. The point we’ve been trying to get across over the last few months is that although the technicals for credit are strong with CSPP, we think the technicals for Bunds are even stronger. See the note at around 1.15pm BST yesterday or ask Sukanto.Chanda@db.com for a copy. It’s likely that the other focus for markets today will be the headlines that emerge from the meeting between President Trump and China President Xi Jingping. So far we haven’t heard much aside from some reports in the press suggesting that Xi will offer Trump a number of sweeteners including further opening of Chinese markets to US companies. Unsurprisingly the Syria news has taken over as the main story for now and it may make for interesting discussions on North Korea given Trump’s actions overnight and his comments last weekend about taking action on North Korea unilaterally if he had to. Separate to this but staying with politics, Supreme Court nominee Neil Gorsuch is expected to be confirmed by the Senate today after majority leader Mitch McConnell scrapped the requirement for nominees to receive 60 votes in the 100 seat Senate in what is called rather extremely the “nuclear option”. Instead a simple majority is all that is required now. Over in markets, geopolitical concerns and the prospect of a payrolls Friday looming helped to keep markets mostly in check yesterday. Both the S&P 500 (+0.19%) and Stoxx 600 (+0.18%) finished with similar modest gains helped by a bit of a boost from the energy sector after WTI Oil (+1.08%) headed back up towards $52/bbl again (above it this morning as we mentioned earlier). Credit indices were also marginally tighter although sovereign bond markets were incredibly muted. 10y Treasuries finished the day a small 0.5bps higher in yield at 2.342% while 10y Bunds were a similar amount higher at 0.259%. Moving on. While markets weren’t particularly exciting yesterday there was plenty of focus on the ECB with the release of the March minutes and also comments from Draghi and his colleagues at the ‘ECB and its watchers’ conference. In terms of the minutes, the text revealed that “looking ahead, it was recalled that, if the euro area economy were to recover further and as inflation proceeded further on its path towards the Governing Council’s inflation aim in a sustained manner, a discussion on policy normalisation would become warranted in the future”. This passage was probably the most significant insofar as it suggested that a likely change to language is coming from the Bank. ECB President Draghi emphasised however that the ECB is still in a steady as we go mode for now after saying that “I do not see cause to deviate from the indications we have been consistently providing in the introductory statement to our press conferences” and that “we have not yet seen sufficient evidence to materially alter our assessment of the inflation outlook which remains conditional on a very substantial degree of monetary accommodation”. Meanwhile ECB Chief Economist Peter Praet said that “forward guidance implies a sequencing between the interest rate policy and the quantitative policy that can most efficiently internalize and exploit the intimate complementarities between these two key components of our current stance”. For completeness, yesterday’s data did little to move the dial. In the US initial jobless claims fell to 234k last week which lowered the four-week average to 250k. In Europe the only notable data came from Germany where factory orders printed at +3.4% mom in February following a sharp decline in January. Looking at the day ahead, this morning in Europe the main focus will likely be on the February industrial production reports which are due to come from Germany, France and the UK. We are also due to get February trade data from those countries as well as house prices data in the UK. Over in the US the aforementioned March employment report will be the main point of focus while wholesale inventories and consumer credit data are the other releases due in the US. Away from the data the Fed’s Dudley is due to give a talk on the state of financial regulation in the US this evening at 5.15pm BST. Away from that BoE Carney speaks this morning at 10am BST while the Euro area finance ministers meeting also kicks off in Malta today. Clearly any headlines which emerge from Trump’s meeting with Xi Jingping are also worth watching. This morning, the Bank of Italy reported that Italy’s Target 2 deficit rose to new highs in March at €420bn, from €386bn in February. As a way of comparison, during the peak of the EU Sovereign crisis in 2012 crisis, Italy’s liabilities stood at Eur 290bn. As Francesco Filia of Fasanara Capital notes, while we are told that record T2 balances are pure accounting values and should be viewed as a benign by-product of the decentralized implementation of the asset purchase program (APP) rather than renewed capital flight, and while Draghi refers to them as a form of solidarity within the European system, in a letter to Italian EU politicians Draghi also maintained that such debts should be settled in full should Italy decide to leave the euro. So, the number matters and represents a liability. Target II liabilities are now above 25% of GDP In Italy (from 22% in January), and above 30% of GDP in Spain. Similarly to what happened in 2012, it is imaginable for Germany to soon start to feel uncomfortable with such levels of exposure and demand more vocally a reversal of the trend. At the time, it sufficed for Draghi to cheap talk about the ‘irreversibility’ of the EUR for the trend to reverse. In contrast, this time around, the ECB is tapering, on the presumption of economic growth to take firm hold, and on evidence of inflation having resurfaced. Tapering can be seen as a way to reverse those Target II flows, or at least prevent them from rising further. Incidentally, tapering is today also needed to prevent too heavy a tax on German savers / electorate, as they are hit hard by negative real rates, now that inflation spiked up for the first time in a while: with inflation at 1.9% and short term rates at almost -1%, real rates are negative by 2% to 3%, and the German electorate is paying for the EMU party more than ever before. It should also be said that Target II deficit should be seen as one of the components of country risk, not the only one or the most relevant one. Take the case of Italy, for example, where the Target 2 euro system exposure at €420bn is to be added to BTP owned by foreigners (approx. €710bn at the end of 2016), funding (non-financial deposits and interbank funding) for Italian banks (in excess of €350BN), financing to Italian companies made by foreigners (€700bn+). On the side of public debt alone, Italy spends 5% of GDP in interest payments alone. This is the background against which tapering enters the stage, and rates rise. Early this morning we reported that as part of its response to the Syrian attack, in addition to suspending communication with U.S. forces designed to stop planes colliding over Syria, the Russian frigate Admiral Grigorovich would be deployed to the Tartus naval base in Syria. 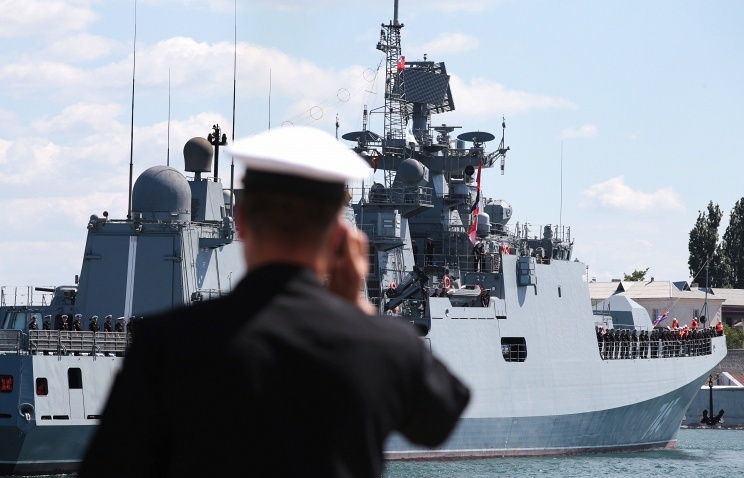 The Russian Black Sea Fleet’s frigate The Admiral Grigorovich, currently on a routine voyage, would enter the Mediterranean later on Friday, a military-diplomatic source in Moscow told TASS, adding that the ship would make a stop at the logistics base in Syria’s port of Tartus. Russia wasted no time, and as FN reports, moments ago, the Russian frigate, Admiral Grigorovich RFS-494, crossed through the Bosphorus Strait “a few hours ago” from the Black Sea, according to a U.S. defense official. The Russian warship is now in the eastern Mediterranean steaming in the direction of the U.S. warships. The Admiral Grigorovich is armed with advanced Kalibr cruise missiles. According to the official version, the frigate was bound for the Syrian port of Tartus on a routine voyage, the Russian news agency TASS reported Friday, citing a military-diplomatic source. “The Russian ship armed with cruise missiles Kalibr will visit the logistics base in Tartus, Syria,” the source said, according to TASS. The ship was currently near the Black Sea straits, Tass reported. The ship left on a voyage after stopping at Novorossiisk for supplies and taking part in a joint exercise with Turkish ships in the Black Sea. Authorities have released the following photo of a “person of interest” in today’s terrorist attack. Update 12:01 pm: In a press briefing, the Swedish police says that there have been no arrests made after the truck incident in Stockholm. It said it can’t confirm number of casualties or injured after the attack; refers to hospitals, and added that it is not “not in contact” with truck driver, or drivers. The police also showed the below image of a person of interest, tied to the place of the truck crash around time of incident. The Swedish Security Service has activated the international network. Update 11:25 am: While reports that a suspect has been arrested have been denied so far by the police, moments ago a clip was released which allegedly shows the moment a terror suspect is wrestled to floor by Swedish police after attack. An arrest has yet to be confirmed, as SVT state television reports that the truck driving suspect is still at large. #BREAKING video: moment terror suspect is wrestled to floor by #Swedish police after attack. Update 11:02 am: Another statement from the Swedish police, which said it currently cannot rule out that attack in Stockholm is an act of terror, given recent events in the rest of Europe. The police refutes a previous report, and say that no one has yet been arrested. They also note that there are reports of gun shots from different parts of Stockholm, although police can’t currently confirm those. Update 9:58 am: per the latest reports, up to 5 people have been killed with one of the suspects reportedly in custody, while Prime Minister Lofven says that the incident is a “terror attack.” As of this moment, all subway traffic in Stockholm has been shutdown. Update 9:52am: according to Expressen, three armed men jumped out of the truck that hit people at the department store. Additionally, Swedish police is urging people to stay away from Stockholm City. In what appears to be the latest vehicle-based terrorist attack, a truck has rammed people on a street in central Stockholm, according to witnesses cited by Aftonbladet newspaper. The incident took place when a truck is said to have plowed into a department store, causing multiple casualties. A worker at Ahlens department store said the truck drove into the store’s perfume department. He said an alarm went off inside the store and everyone was asked to leave the building, SVT reported. A photo posted online shows the truck after it crashed into Åhlens department store, with the caption stating that the vehicle came from a direction in which trucks are not allowed. Helicopters are circling above the area, a witness told SVT. 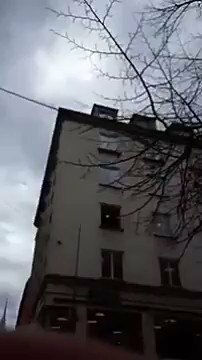 Footage posted on Twitter shows panicked pedestrians fleeing the scene. NBC Eyewitness Maria Nathalie was in the department store at the time of the incident. “People started running down the stairs when the fire alarm started,” she told NBC News. “And when we came down to the bottom of the building all we could see was a lot of smoke and there was someone who helped us get out on the other side of the building. There is an unknown number of injured people in the incident, media reported citing Towe Hägg at Stockholm police. Swedish police have said that the Truck incident may be terror related. A vehicle has run into (and killed) a number of people at Drottninggatan in central Stockholm, according to Aftonbladet. There are dead people on the street, said a witness told Expressen. For the 12th week in a row, the number of US oil rigs rose (up another 10 to 672 – the highest since September 2015). US Crude production continues to track the lagged rig count, pouring more cold water on OPEC’s production cut party. The rig count grows, tracking the lagged oil price in a self-defeating cycle. And crude production appears to have plenty more room to run. 1. Europe stocks IN THE RED BUT POINTING BADLY SOUTH! The 30 yr bond yield 2.972, DOWN 1 IN BASIS POINTS from THURSDAY night. USA dollar index early FRIDAY morning: 100.82 UP 15 CENT(S) from THURSDAY’s close. The British pound at 5 pm: Great Britain Pound/USA: 1.2368 : DOWN .0099 OR 99 BASIS POINTS. On the surface, and in equities, it was a painfully boring day. Stocks tumbled overnight after yesterday’s Syrian airstrikes, then as it emerged that the conflict will likely be contained, futures ground higher and not even the worst jobs report in nearly a year managed to put a damper on today’s rebound, as the narrative shifted to the drop in the unemployment rate, which dropped to 4.5% on the back of a 400K+ increase in employment according to the BLS’ Household Survey. … which ended up closing the day small in the red, despite so much earlier drama. And yet, while on the surface things appeared calm, below the surface, and especially in the Eurodollar complex there was a surge in activity, courtesy of the abovementioned Bill Dudley remarks. … and was threatening to pull the technical support for the 10Y. In fact, with the 10Y dropping as low as 2.28% in early trading during the overnight, risk-aversion phase, the reflation trade appeared all but dead. While those words were largely ignored by equity traders, momo chasers and various algos, they meant all the difference to Eurodollar traders, and anyone who had assumed that following Bill Dudley’s comments last week, that the Fed would “pause” its rate hikes during the balance sheet runoff phase. We’ll start with the result, and show just how big the move in the EDZ7/EDZ8 trade was: what the chart below shows is that as a result of Dudley’s hawkish comments, the Eurodollar spread spiked to the highest level since the FOMC Minutes, where as a reminder the Fed’s balance sheet unwind was a primary topic. So what happened? As RBC’s Charlie McElligott expains, Dudley delivered the “clarification heard ‘round the (global macro trading) world,” as Dudley, in a mid-Friday afternoon interview, sought to alter the market’s initial interpretation of his massively impactful comments made last week, in turn disrupting thematic trades across the macro landscape. Those comments about the likelihood of a “little pause” in the Fed’s hiking trajectory as-and-when the FOMC begins the process of balance-sheet normalization sent shockwaves through the front-end of the US rates complex, forcing devastating stop-outs / unwinds in MEGA popular macro “reflation” trades like Eurodollar redpack shorts / EDZ7EDZ8 steepeners and the EDZ7-8-9 butterfly and a LOT pain at various and unconstrained funds over the course of the past week. Essentially, Dudley said that the Fed will NOT be substituting B/S policy tweaks for Fed hikes, which as noted had quickly become the new market narrative in short-order. He was clearly taken aback by the market reaction to his comments and viewing them as a statement on the Fed looking to reduce the scale of the overall 2018 hiking landscape. In turn, the price-action via the stop-outs and unwinds in the front-end trades over the past week were violently reversed this afternoon. Indeed, as the chart below shows, the vollume in the Eurodollar spread was the highest since election night! Some other aftereffects: nominal yields turned sharply higher. Breakevens turned off their worst levels too. UST curves flattened. The US Dollar screamed higher against everything from G10 to EM (everybody’s recent ‘fave’ high-yielding longs as it seemed the Dollar was ‘stuck’). In equities, the higher rates dynamic reinvigorate “cyclicals” and “value” factor, while “defensives” / “low volatility” / “anti-beta” factor market-neutral rolled over. And as I’ve been pointing-out, “growth” logically settled-back too, as it had become a hyper-crowded “hiding-place” over the course of the year as investors sought stocks which could perform without fiscal policy and interest rate exposure. Thus, FAANG and PANE (FB, AAPL, AMZN, NFLX, GOOGL and PCLN, AMZN, NFLX, EXPE story stocks in tech / consumer discretionary) lagged broad index on the day. Thus ‘momentum’ market-neutral reversing lower on the day too. As such, I’m getting sudden jolts of confidence from the last of the ‘reflation hold-out’ clients, now feeling really emboldened. And for the folks who didn’t cover their rates shorts or unwind their ED$ curve trades, there are now STATUES being built for Dudley in various fund offices around midtown. The one RISK that I see right now for ‘risk’ is this: that we are seeing the largest move TIGHTER in ‘real rates’ since the day post-March Fed hike. This idea of “tightening faster than we are growing” / “inflating faster than we’re growing” continues to be a concern to monitor. Bloomberg opined also, noting that Dudley comments benefited a fresh wave of hawkish Eurodollar Bets. Re-established downside options positioning across eurodollars unexpectedly benefited from Dudley comments Friday as focus shifts to clarity from Yellen on Monday. Signs are emerging that traders are looking to re-establish eurodollar put positions across 2018 maturities, potentially a sign that the rally in reds — triggered by Dudley’s comments a week ago — may have been overdone. Friday’s CME open interest changes rose in June 2018 eurodollar puts by 106k contracts; largest gains across 9762 (+25k), 9800 (+30k) and 9812 (+48k) strikes consistent with downside trades initiated Thursday. While open interest is starting to build again across June-18 eurodollar puts, there has been a sharp drop in Jun-17 open interest, reflecting position liquidation. Latest CFTC positioning data, covering week ending April 4, shows speculators adding $1.8M/DV01, to record eurodollar shorts. Earlier this week, a purge of eurodollar positions saw heavy losses, one of which included a trade liquidated Wednesday for a $15m hit, across Jun/Sept./Dec mid-curve eurodollar spreads from March 1. The purge came as a result of a collapse in eurodollar spreads, along with the Fed probability term structure which inverted as the rate-hike probability edged higher for June 2017 but then fell further out after Dudley’s comments last week. If all of this sounds overly technical for regular equity traders, don’t worry it is, however the implications for the yield curve, and thus the reflation trade, or what’s left of it, are substantial. It also means that as we pointed out yesterday, suddenly focus has intensified on Janet Yellen, who’s scheduled to speak at 4pm Monday at University of Michigan, taking questions from the audience and Twitter. What she says may roil if not the equity market, then certainly lead to a new set of big headaches for eurodollar traders. As previewed earlier tonight, the United States fired a barrage of cruise missiles into Syria on Friday morning in retaliation for this week’s alleged chemical weapons attack against civilians by the Assad regime, U.S. officials said. It was the first direct American assault on the Syrian government and Donald Trump’s most dramatic military order since becoming president. According to NBC, only tomahawks missiles fired, no fixed wing aircraft involved, for now. The strike early Friday morning in Syria targeted hangars, planes and fuel tanks at one Syrian military airfield, according to a U.S. official. The U.S. attacked with about 60 Raytheon Co. Tomahawk cruise missiles fired from two Navy destroyers. NBC adds that a high ranking administration official says foreign countries from Arab states to Canada supported tonight’s strikes vs. Syria. 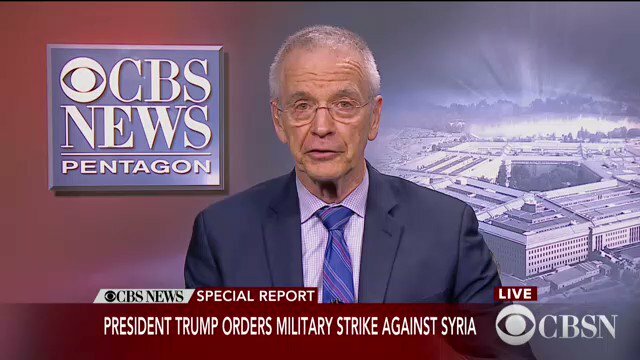 MORE: U.S launches cruise missiles from ships in Mediterranean, targeting single airfield in Syria, @CBSDavidMartin reports. It was not immediately clear if Trump’s action had been precleared with Putin in advance. 10Y Treasury yields fell to a 2.26% handle – the lowest since Nov 18th and breaking the reflation-trade support – after a 4 sigma miss in payrolls this morning. Gold jerked higher once again – almost erasing the entire post-election loss, stocks and the dollar are under pressure. My fellow Americans, on Tuesday Syrian dictator Bashar al Assad launched a horrible chemical weapons attack on innocent civilians. using a deadly nerve agent, Assad choked out the lives of helpless men, women and children. It was a slow and brutal death for so many, even beautiful babies were cruelly murdered in this very barbaric attack. No child of God should ever suffer such horror. Tonight I ordered a targeted military strike on the airfield in Syria from where the chemical attack was launched. It is in this vital national security interest of the United States to prevent and deter the spread and use of deadly chemical weapons. There can be no dispute that Syria used banned chemical weapons violated its obligations under the chemical weapons convention and ignored the urging of the UN Security Council. Years of previous attempts at changing Assad’s behavior have all failed and failed very dramatically. As a result the refugee crisis continues to deepen and the region continues to destabilize threatening the United States and its allies. Tonight I call on all civilized nations to join us in seeking to end the slaughter and bloodshed in Syria. And also to end terrorism of all kinds and all types. We ask for God’s wisdom as we face the challenge of our very troubled world. We pray for the lives of the wounded and for the souls of those who have passed and we hope that as long as american stands for justice then peace and harmony will in the end prevail. Goodnight and God bless America and the entire world. Thank you. Pentagon Spokesman Capt. Jeff Davis has issued the following statement on the U.S. strike in Syria in which US ships launched 59 Tomahawk cruide missiles at Syria. At the direction of the president, U.S. forces conducted a cruise missile strike against a Syrian Air Force airfield today at about 8:40 p.m. EDT (4:40 a.m., April 7, in Syria). The strike targeted Shayrat Airfield in Homs governorate, and were in response to the Syrian government’s chemical weapons attack April 4 in Khan Sheikhoun, which killed and injured hundreds of innocent Syrian people, including women and children. A CNN anchor was left speechless Wednesday during a televised interview when a congressman questioned the mainstream narrative that Bashar al-Assad attacked his own people with chemical weapons this week. “It’s hard to know exactly what’s happening in Syria right now. I’d like to know specifically how that release of chemical gas, if it did occur — and it looks like it did — how that occurred,” Representative Thomas Massie toldCNN’s Kate Bolduan. Massie began to answer, but Bolduan cut him off. Unsurprisingly, she asked him directly if he was saying he believes what the Russians are saying — that Assad had nothing to do with the attack that killed dozens in Syria on Tuesday. Reutersreported Wednesday that the attack has sparked renewed calls to oust the country’s president. Eleven weeks into his administration, Trump’s Syrian airstrikes appear to have achieve what until last night appeared impossible: unite much of Congress in support of a Trump decision. As Bloomberg report, U.S. lawmakers mostly expressed support for Trump’s strike against a Syrian airfield in response to an alleged chemical weapons attack, though some cautioned that Congress needs to be consulted on a comprehensive strategy if the strike is a harbinger of things to come. It’s a contrast from 2013, when President Obama sought authorization for force against Syria but was met with widespread opposition. That effort was later abandoned for lack of support. Defense hawks and those who’ve warned against foreign military entanglements responded as expected. However, the bulk of lawmakers sought more details, with several seeking a new authorization of force specific to Syria. Russia To Upgrade Syria Air Defenses, Suspends Airspace Pact With U.S. If Trump wanted to provoke the Kremlin – an odd decision considering all the daily “press coverage” that the Kremlin controlled the president – he has achieved just that: Russia said it will reinforce Syria’s air defences and, as reported previously, is sending a missile carrying warship to the eastern Mediterranean in response to a US cruise missile strikes on a Syrian government airbase. 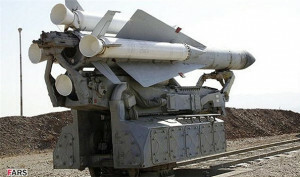 The Russian ministry of defence said in a statement that “to protect key Syrian infrastructure a range of measures will be taken reinforce and improve the effectiveness of the Syrian armed forces air defence.” The announcement came as the Admiral Grigorevich, a cruise missile carrying frigate, passed through the Bosporus en-route to Russia’s Syrian navy base at Tartus. Also on Friday Russia announced it had halted its air safety agreement with the US, meant to avoid “air incidents” with the US over Syria, saying US air strikes had caused “considerable” damage to Moscow-Washington relations. The memorandum, signed in October 2015, was designed to avoid clashes in the crowded airspace over Syria, with each side giving the other warning over planned strikes. The defense ministry also said that six MiG-23 fighter jets were destroyed in the US missile strike on a Syrian airfield in Homs province, but the runway remained intact. The strike on the Shayrat airfield in Syria’s Homs Province destroyed a material storage depot, a training facility, a canteen, six MiG-23 aircraft in repair hangars and a radar station. Two Syrian servicemen are missing as a result of the US attack on an airfield in the country, while four were killed and six were injured extinguishing the flames, Russian Defense Ministry spokesman Maj. Gen. Igor Konashenkov said Friday. “According to the information of the leadership of the Syrian airbase, two Syrian servicemen went missing, four were killed and six received burn injuries during the firefighting,” he said. The ministry also pointed to the events that followed the strikes, a large-scale offensive against the Syrian Army carried out by Islamic State and Al-Nusra Front terrorists. “We hope that this offensive was in no way coordinated with the US,” the ministry said. 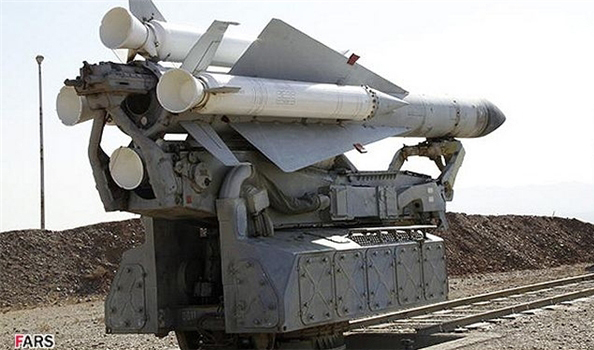 “A number of measures aimed at strengthening and improving the effectiveness of the Syrian air defense system will be implemented in the near future in order to protect the vital parts of the Syrian infrastructure,” Konashenkov said. The Russian president said he sees the US missile strikes as an attempt to distract attention from civilian casualties in Iraq, Peskov added. “This step deals significant damage to US-Russian ties, which are already in a deplorable state,” Peskov said and added that the US has been ignoring the use of chemical weapons by terrorists and this is dramatically aggravating the situation, in Putin’s opinion. “The main thing, Putin believes, is that this move [by the U.S.] doesn’t draw us nearer to the end goal in the fight with international terrorism and on the contrary, deals a serious setback to the creation of an international coalition in the fight with it,” Peskov said. Other Russians took the opportunity to opine as well, led by Russian foreign minister Sergey Lavrov who said the US missile attack on a Syrian airbase is an act of aggression under a far-fetched pretext and is reminiscent of the 2003 invasion of Iraq. Moscow will demand truth of Idlib events, Lavrov stressed. “It is regrettable that all these causes do more harm to the already damaged relations between Russia and the United States. Hope remains that these provocations will not entail irreversible effects,” Lavrov said. Russian lawmakers also took to the microphone on Friday, warning that the U.S. airstrikes in Syria could lead to an escalation of conflict in the Middle East and dash any plans for a U.S.-Russian coalition against terrorism. “It’s a new round of escalation in the Middle East. These ill-judged, irresponsible actions don’t contribute to global security, security in the Middle East,” Andrei Krasov, the first deputy head of the defense committee in the Russian lower house of parliament, told state news agency RIA. “Other military conflicts, an expansion of military conflicts, are entirely possible,” he added. He said the aim of the U.S. strike was to “rubber stamp” responsibility on Mr. Assad’s for the chemical attack in Idlib province on Tuesday. “‘The walls of Trump’ are multiplying. And everything started so well. It’s a real shame,” said a post on the Facebook page of Mr. Kosachev, head of the international relations committee in Russia’s upper house of Parliament. Another lawmaker, Mikhail Emelyanov, warned against the risk of clashes between Russian and U.S. forces. “The U.S. is being dragged into the war in Syria in the full knowledge that Russia is supporting Syria and our troops are there, which means it’s fraught with direct clashes between Russia and the U.S. and the consequences could be the most serious, even armed clashes and exchanges of strikes,” Mr. Emelyanov told Interfax news agency. In immediate response, Moscow suspended its memorandum of understanding on flight safety in Syria with the US following the missile strike, calling the attack “a demonstration of force.” The Russian military has supported the Syrian government’s version of the events in Idlib, saying that Damascus attacked an arms depot where chemical weapons had been stockpiled by Islamic State and Al-Nusra Front militants. “Obviously, the cruise missile attack was prepared beforehand. Any expert can tell that the decision to strike was made in Washington before the events in Idlib, which were used as a pretext for a demonstration,” the statement reads. The Memorandum on air safety was signed in October 2015, after Russia came to Syria to fight international terrorism at the invitation of the country’s government. The document of understanding was designed to prevent possible mishaps between the Russian and US Air Forces operating independently in the region. Additionally, according to Tass, in response to the strikes, the Russian frigate Admiral Grigorovich armed with Kalibr cruise missiles will be deployed to the Tartus naval base in Syria. The Russian Black Sea Fleet’s frigate The Admiral Grigorovich, currently on a routine voyage, will enter the Mediterranean later on Friday, a military-diplomatic source in Moscow told TASS, adding that the ship would make a stop at the logistics base in Syria’s port of Tartus. The Admiral Grigorovich is currently near the Black Sea straits. It is scheduled to enter the Mediterranean at about 14:00 Moscow time. The ship left on a voyage after replenishing supplies at Novorossiisk and taking part in a joint exercise with Turkish ships in the Black Sea. Tass’s source said the frigate’s presence off Syria’s shores will depend on the situation. Meanwhile, the International Committee of the Red Criss told Reuters that the situation in Syria “amounts to an international armed conflict” following U.S. missile strikes on a Syrian airbase. “Any military operation by a state on the territory of another without the consent of the other amounts to an international armed conflict,” ICRC spokeswoman Iolanda Jaquemet told Reuters in Geneva in response to a query. Previous air strikes on Syrian territory by a U.S.-led coalition have been against only the militant group Islamic State, which is also the enemy of the Syrian government. Russia has carried out air strikes in tandem with its ally Syria since Sept. 2015, while Iranian militias are also fighting alongside the troops of Syrian President Bashar al-Assad. ICRC officials were raising the U.S. attack with U.S. authorities as part of its ongoing confidential dialogue with parties to the conflict, Jaquemet said, declining to give details. The ICRC, guardian of the Geneva Conventions setting down the rules of war, declared Syria an internal armed conflict – or civil war, in layman’s terms – in July 2012. And so the reflation trade is dead once again. So much for that blockbuster ADP report. As we cautioned previously in our payrolls preview, the big risk to today’s payrolls report was to the downside, mostly as a result of the unseasonably cold March weather, and moments ago the BLS confirmed that indeed something snapped in March when only 98K jobs were added, roughly half of the 180K expected. This was the lowest monthly jobs number since May of 2016. Worse, both prior months were revised lower. The change in total nonfarm payroll employment for January was revised down from +238,000 to +216,000, and the change for February was revised down from +235,000 to +219,000. With these revisions, employment gains in January and February combined were 38,000 less than previously reported. What is surprising is that the poor Establishment Survey number was on the back of a very strong Household Survey, which saw employment rise by 472,000 to 153 million, while the number of unemployed Americans reportedly declined by 326K to a seasonally adjusted 7,202K. There were no changes to the participation rate, which remained at 63% with the number of people not in the labor force barely changed at 94,213 million. That other closely watched indicator, average hourly earnings, rose in line with expectations at 0.2% m/m, while the annual increased also matched expectations of Y/y 2.7%, dipping modestly from last month’s 2.8%. Total nonfarm payroll employment edged up by 98,000 in March, following gains of 219,000 in February and 216,000 in January. Over the month, employment growth occurred in professional and business services (+56,000) and in mining (+11,000), while retail trade lost jobs (-30,000). In March, employment in professional and business services rose by 56,000, about in line with the average monthly gain over the prior 12 months. Over the month, job gains occurred in services to buildings and dwellings (+17,000) and in architectural and engineering services (+7,000). Mining added 11,000 jobs in March, with most of the gain occurring in support activities for mining (+9,000). Mining employment has risen by 35,000 since reaching a recent low in October 2016. In March, employment continued to trend up in health care (+14,000), with job gains in hospitals (+9,000) and outpatient care centers (+6,000). In the first 3 months of this year, health care added an average of 20,000 jobs per month, compared with an average monthly gain of 32,000 in 2016. Employment in financial activities continued to trend up in March (+9,000) and has increased by 178,000 over the past 12 months. Construction employment changed little in March (+6,000), following a gain of 59,000 in February. Employment in construction has been trending up since late last summer, largely among specialty trade contractors and in residential building. Retail trade lost 30,000 jobs in March. Employment in general merchandise stores declined by 35,000 in March and has declined by 89,000 since a recent high in October 2016. The average workweek for all employees on private nonfarm payrolls was unchanged at 34.3 hours in March. In manufacturing, the workweek edged down by 0.2 hour to 40.6 hours, and overtime edged down by 0.1 hour to 3.2 hours. The average workweek for production and nonsupervisory employees on private nonfarm payrolls edged down by 0.1 hour to 33.5 hours. In March, average hourly earnings for all employees on private nonfarm payrolls increased by 5 cents to $26.14, following a 7-cent increase in February. Over the year, average hourly earnings have risen by 68 cents, or 2.7 percent. In March, average hourly earnings of private-sector production and nonsupervisory employees increased by 4 cents to $21.90. March was a month of giving back: after a very strong, if downward revised start to the year, with both January and February payrolls revised lower by a total of 38,000 jobs, March saw the worst job gains since May 2016, with only 98,000 jobs added. While many have claimed it was the weather’s fault, the BLS reported that 164K people said they were unable to work in March due to poor weather conditions. This was just fractionally more than the 143K long-term average. While most job sectors performed in line with recent trends, there were three major outliers: growth in the Education and Health jobs category tumbled from +66K to +16K; Construction jobs dropped from +59K to +6K, while the big detractor was Retail Trade, where for the second month in a row, 30K jobs were lost. Worse, employment in general merchandise stores declined by 35,000 in March and has declined by 89,000 since a recent high in October 2016, which confirms the recent speculation that “bricks and mortar” stores and malls in general may be the next big short. The one bright category was Professional and Business Services, where March saw an increase in monthly payrolls from 27.1K to 45.5K, however of this the biggest category was the odd “Services to buildings and dwellings”, i.e. Doormen and Supers. Finally, everyone’s favorite job category, waiters and bartenders, aka “Food services and drinking places” leisure workers, continued their relentless rise, adding another 21.7K jobs in March. The complete breakdown of changes in key job categories in February and March is shown in the chart below. Ever since Bannon was removed from Trump’s National Security Council a couple of days ago, rumors have swirled that his days in the White House could be numbered. Killing Bannon won’t be easy: His staunchest ally is one of Trump’s closest confidants — Attorney General Jeff Sessions. Kellyanne Conway will go to the mat for him, as will policy advisor Stephen Miller. He’s also built strong relationships with other cabinet secretaries including Commerce Secretary Wilbur Ross and Treasury Secretary Steve Mnuchin. In the end, though, family matters most and all but dad are done with Bannon and his politics. Meanwhile, recent moves that seemingly consolidate the power base of Jared and Ivanka have only served to fan the speculation of unrest. Jared Kushner seizes control over structuring government at home and America’s public face aboard. Ivanka Trump adviser Dina Powell is named Deputy National Security Adviser, and keeps her portfolio as senior counselor for economic initiatives. Meanwhile, the list of potential Chief of Staff candidates rumored to replace Priebus include House Majority Leader Kevin McCarthy and former Goldman Sachs president, Gary Cohn. Media speculation gone wild or is the White House Game of Thrones about to claim its first major victims? The new forecast for first quarter GDP: only .6% and these bozos want to raise rates? Remember when the Fed was “data dependent”? Well, if the Atlanta Fed is right, Janet Yellen will have hiked the Fed’s interest rate in a quarter in which GDP has grown by a paltry 0.6%, down from 1.2% as of its latest estimate. If confirmed, this would be the lowest quarterly GDP growth in three years, since Q1 of 2014. Incidentally, just over two months ago, the same forecast stood at 3.4%, it has since fallen by over 80%. The GDPNow model forecast for real GDP growth (seasonally adjusted annual rate) in the first quarter of 2017 is 0.6 percent on April 7, down from 1.2 percent on April 4. The forecast for first-quarter real GDP growth fell 0.4 percentage points after the light vehicle sales release from the U.S. Bureau of Economic Analysis and the ISM Non-Manufacturing Report On Business from the Institute for Supply Management on Wednesday and 0.2 percentage points after the employment release from the U.S. Bureau of Labor Statistics and the wholesale trade release from the U.S. Census Bureau this morning. Since April 4, the forecasts for first-quarter real consumer spending growth and real nonresidential equipment investment growth have fallen from 1.2 percent and 9.7 percent to 0.6 percent and 5.6 percent, respectively. And now back to those “animal spirited” soft surveys which have also been sliding in the past few months. This is the reason for the sudden gold/silver drop at 1 pm. Shear nonsense! … as well as pushing stocks ro session highs. The jerk higher in the USDJPY also slammed gold to overnight session lows. in which he pointed out that balance sheet normalization would likely lead to only a “little pause” in rate hikes to avoid concurrent policy moves. As discussed before, the reason why the Fed is contemplating a concurrent approach is to prevent a flattening or outright inversion of the curve, and as the short end rises, selling the long end by the Fed would lead to a parallel steepening in rates, something which would be critical for US banks. And while it is unclear if Dudley was the catalyst for today’s move higher, what is clear is that some algos bought because some other algos bought. Unlike last month’s unexpectedly weak consumer credit report, which saw a plunge in revolving, or credit card, debt moments ago the Fed, in its latest G.19 release, announced that there were few surprises in the February report: Total revolving credit rose by $2.9 billion, undoing last month’s $2.6 billion drop – the biggest since 2012 – while non-revolving credit increased by $12.3 billion, for a total increase in February consumer credit of $15.2 billion, roughly in line with the $15 billion expected. …. where it now joins both auto ($1.1 trillion) and student ($1.4 trillion) loans, both of which are well above $1 trillion as of this moment. If The Fed Sells Treasuries… Who Will Be Buying? Answer: “Other” (Seriously)! From 1776 through 2007, the US issued just over $9 trillion in US Treasury debt to pay for stuff which “we” wanted but “we” were unwilling to tax ourselves to pay for. The buyers during that period are depicted in the first column of the chart below. During that time, the majority buyer of that debt was the Intra-Governmental Surplus funds (primarily Social Security) as depicted by the green area in the first column below. These funds were mandated to buy “governmental accounting series” non-marketable debt. The remainder of the issuance and holdings were fairly evenly split between foreigners and domestic buyers (primarily institutional buying) with a minor portion of primarily short term Notes and Bills held by the Federal Reserve. From 2008–>2014, the US Treasury nearly issued as much debt as it had in the previous 230+ years. But the proportions bought and held by these creditors significantly changed (depicted by middle column in the chart below). Intra-Governmental surplus funds were dwindling so the buyer of nearly half of all Treasury debt up to that point took a back seat, buying only 8% of the new issuance. No surprise, it was the Federal Reserve and Foreigners that bought 2/3rds of the issuance, maintaining a strong bid. The Fed sold all it’s short term bills and notes and went large and long. And foreigners apparently just couldn’t get enough. But since QE ended in late 2014, the make-up of the new buyers / holders of US Treasury debt is totally different (depicted in the right column of the chart below). Obviously, the Fed Reserve has purchased nothing (on a net new basis…of course they have been buying to replace bonds rolling off, but no net new buying) and since the Fed ceased buying, Foreigners (net) have sworn off US Treasury debt and sold $200+ billion. So the only buyers for the continuing issuance and the portion not rolled over by foreigners is the domestic public (with an assist by the dwindling Intra-Governmental surplus). Well, this should beg the question, who among the domestic public is buying all those still near record low yielding Treasury’s? Great question, and according to the latest Treasury Bulletin we have our answer, “Other Investors” (with an assist from mutual funds) are the primary buyers (chart below). Banks bought a little, private parties less, and insurers even less. State/local funds sure aren’t being used to buy US Treasury’s…and US savings bonds are a thing of the past. Interestingly, the “other” category has nearly doubled since September of 2014 from less than a trillion to $1.8 trillion. So the Treasury market is supported by “other investors” which unfortunately the Treasury Bulletin provides no more detail about plus mutual funds. And all this while stock and real estate markets are flush with cash, leveraging indices to record highs despite the trillion plus being pulled away from these sectors to buy Treasury’s??? All makes sense to me and I’m sure there’s no reason to look further (and I’m pretty sure nobody will)! And just to play this out, where exactly has that Intra-Governmental surplus (that has made up a quarter of Treasury demand since QE ended) come from? Clearly not from America’s #1 creditor, the aging boomer and their dwindling Social Security surplus. They are on the verge of turning from a source of credit to deficit (chart below). Shocker, “Other” is the primary buyer within the Intra-Governmental Surplus, again coming from the Treasury and highlighted in an older post HERE. I’m not exactly expecting rates to rise anytime soon despite CBO claims that rates are inevitably going up as deficits sky rocket. Just consider, when the largest Treasury holder (IG) began to slow it’s accumulation in ’08 coincident with subsequent record ’08–>’12 Treasury issuance, foreigners and the Fed took over and rates went down. As China and the BRICS ceased net buying Treasury debt in July 2011 (and never returned), the BLICS appeared and rates went down (Detailed HERE). As the Fed ceased QE1 and all economists knew rates must rise…rates shocked 100% of economists and fell by a third. As the Fed tapered and ceased QEIII and foreigners likewise ceased buying Treasury’s from ’14 onward, “other” took over and rates hardly budged!?! Not exactly the hallmarks of a “free market”. Update: After weeks of endless rhetoric and party bickering over the controversial usage of the ‘nuclear option’, Neil Gorsuch has officially been confirmed to the Supreme Court of the United States with a largely partisan vote. Following a series of procedural votes yesterday to invoke the so-called ‘nuclear option’, the Senate is expected to vote shortly to confirm Neil Gorsuch as the 113th justice to serve on the Supreme Court. Given the rule changes implemented yesterday, Republicans require only a simple majority vote to confirm Gorsuch, and with Republicans holding a 52-48 majority in the Senate, today’s vote is all but a foregone conclusion. And while it will mostly be a partisan vote, 3 Democrats are also expected to support Gorsuch for a final vote tally of 55-45. In a historic vote, Senate Republicans on Thursday crushed “a Democratic blockade” – in Reuters’ words – of Trump’s Supreme Court nominee Neil Gorsuch, in a fierce partisan brawl, approving a rule change dubbed the “nuclear option” to allow for conservative judge Neil Gorsuch’s confirmation by Friday. The Senate voted 52-48 along party lines to repeal a rule allowing filibusters against Supreme Court nominees,invoking the so-called nuclear option, and clearing the way for Gorsuch confirmation who now needs a simple majority for nomination. Shortly thereafter, the Senate voted 55-45 to end debate on Gorsuch’s nomination, setting up a final vote expected Friday. Thanks to the new rule enacted earlier Thursday, a simple majority was needed. “This will be the first and last partisan filibuster of the Supreme Court,” Republican Senate Majority Leader Mitch McConnell said on the Senate floor, accusing Democrats of trying to inflict political damage on Trump and to keep more conservatives from joining the high court. “In 20 or 30 or 40 years, we will sadly point to today as a turning point in the history of the Senate and the Supreme Court, a day when we irrevocably moved further away from the principles our founders intended for these institutions: principles of bipartisanship, moderation and consensus,” Senate Democratic leader Chuck Schumer said on the Senate floor. McConnell initiated the rules change by raising a point of order asserting that simple-majority votes should advance Supreme Court nominees to final confirmation votes. Democrats tried to delay it by offering motions to postpone a vote and to adjourn the chamber, but both fell short as Republicans stayed unified. Earlier Thursday, McConnell said the rules change would restore the Senate’s tradition of considering a Supreme Court nominee based on credentials instead of ideology. He called the Democratic filibuster of Goruch “a radical move” and something “completely unprecedented in the history of our Senate.” “This threatened filibuster cannot be allowed to succeed or to continue for the sake of the Senate, for the sake of the court and for the sake our country,” he said. Earlier in the day, Democrats successfully blocked Gorsuch’s nomination from getting 60 votes earlier Thursday morning, prompting Republicans to go “nuclear” and change the rules to allow Gorsuch and future Supreme Court nominees to clear the Senate with only a simple majority. Democrats tried to delay the rules change vote by offering motions to postpone a vote and to adjourn the chamber, but both fell short as Republicans stayed unified. Democrat senators Joe Manchin (W.Va.), Heidi Heitkamp (N.D.) and Joe Donnelly (Ind.) voted with Republicans to allow President Trumps’s pick to move forward. “The truth of the matter is that throughout this process, the minority led by their leader has been desperately searching for a justification for their preplanned filibuster,” he said ahead of Thursday’s votes. McConnell added that the current stalemate was part of a decades-long Democratic effort to “politicize the courts and the confirmation process.” “The opposition to this particular nominee is more about the man that nominated him and the party he represents than the nominee himself,” he said. Republicans hinted for weeks that President Trump’s nominee would be confirmed one way or another. McConnell confirmed during a leadership press conference that he had the votes to go “nuclear” if needed. According to The Hill, Republicans appeared resigned to the tactics, arguing if Democrats won’t support Gorsuch — who received the American Bar Association’s highest rating — they won’t allow any GOP nominee to join the Supreme Court. The Republican-backed rule change on Thursday maintains the ability to filibuster legislation. In the past, the nuclear option has been averted when moderates in the two parties compromised to avoid a showdown, but the ferocious partisanship in Washington now made that impossible. With the failure of Republican healthcare legislation in Congress and with federal courts blocking the president’s ban on people from several Muslim-majority nations from entering the United States, securing Gorsuch’s confirmation took on even greater importance for Trump, who took office in January. Senate confirmation of Gorsuch, 49, would restore the nine-seat court’s 5-4 conservative majority, enabling Trump to leave an indelible mark on America’s highest judicial body and fulfill a top campaign promise by the Republican president. Gorsuch could be expected to serve for decades. The “War Card” has been flipped over as President Trump orders an attack on Syria. The attack came as a response to the chemical weapons attack in Syria allegedly by the Assad regime. Not everyone is buying the story it was Assad that ordered a gas attack on his own people. Former Congressman Ron Paul thinks it was a false flag to get the U.S. to make a move against Assad. Now, the U.S. foreign policy in Syria has gone from destroying ISIS to removing Bashar al-Assad from power in Syria. Russia will surely weigh in. Will the Russians stand by and allow Assad to be attacked and removed by the U.S.? One of President Obama’s top advisors has admitted to “unmasking” members of the Trump transition team. Rice says she did nothing wrong and did not do it for political reasons. Republicans think differently and say Rice should testify under oath because this is a huge Constitutional crisis of an outgoing administration spying on an incoming administration to embarrass and undermine it. Other former top Obama Administration officials have also admitted to spying on Trump and leaking classified information. The spying was done for the so-called Russian collusion investigation, but after 8 months, the FBI and investigators have zero to show and no wrongdoing has been found. The Federal Reserve has announced it will be shrinking its balance sheet. During the last housing meltdown in 2008, it bought the underwater assets of big banks. It has more than two trillion dollars in mortgage-backed securities that are now worth something because of the latest housing boom. Gregory Mannarino of TradersChoice.net says the Fed is signaling a market top in housing. It pumped up the mortgage-backed securities it bought by inflating another housing bubble. Now, the Fed is going to dump the securities on the market. Mannarino predicts housing prices will fall and interest rates will rise.